You already know terpenes play a major role in the entourage effect of cannabis. But how can you use this information to buy better products in cannabis retail stores? Interest in terpene information in cannabis is skyrocketing. In 2011 Dr. Ethan Russo put forward the idea that terpenes, not the shape or geographic origin of the plant, play a significant role in the multitude of effects cannabis can produce. At the time, terpenes were an obscure term to most people outside food and beverage science, horticulture and chemistry. Dr. Russo coined the term “entourage effect” and, overtime, the idea was supported by further research and many consumers anecdotal evidence. Fast forward to 2018 and the dynamic of terpenes and cannabis chemistry in the public sphere has shifted. More and more consumers and cannabis retail stores recognize that the terms Sativa, Indica and Hybrid have very little to do with genetics and effects of cannabis. Even the original populator of this naming convention, Leafly, has transformed the way it approaches these terms. Instead, consumers are looking to other parts of the plant for indication on how it may affect the endocannabinoid system, mainly terpenes and rare-cannabinoids (like CBG, CBC, THCV, etc.). Terpenes shape the effects cannabis produce on the human body. For a primer on what these aromatic compounds are and how they work, start with this blog or check out this guide our friends at Leafly put together. So, you’re on board with the idea that terpenes influence the “high” you feel from cannabis, as well as potential medical benefits and, of course, taste. But how can you use this information to buy better products in cannabis retail stores? Before you dive into selecting a terpene profile (such as high-pinene) you should ask the following questions of the product. Does the product list its terpenes? Walking into an i502 cannabis shop in Washington in May 2018, you’ll find a small but growing number of products that list the concentrations of terpenes found in bud, oil, concentrate or other product. If you find a product with terpenes on the box it is already steps ahead of anything without this information. In Washington State terpene testing is not mandatory. This means the producer or processor paid for analytical testing in the interest of consumer knowledge and transparency. Some stores, like Satori in Bellingham, even provide discounts for producers like Heylo that list terpenes on the box. Where are the terpenes from? Not all terpenes are created equal. Terpenes that are all produced from the same cannabis flower that was extracted should be valued higher than reintroduced, non-cannabis or synthetic terpenes. 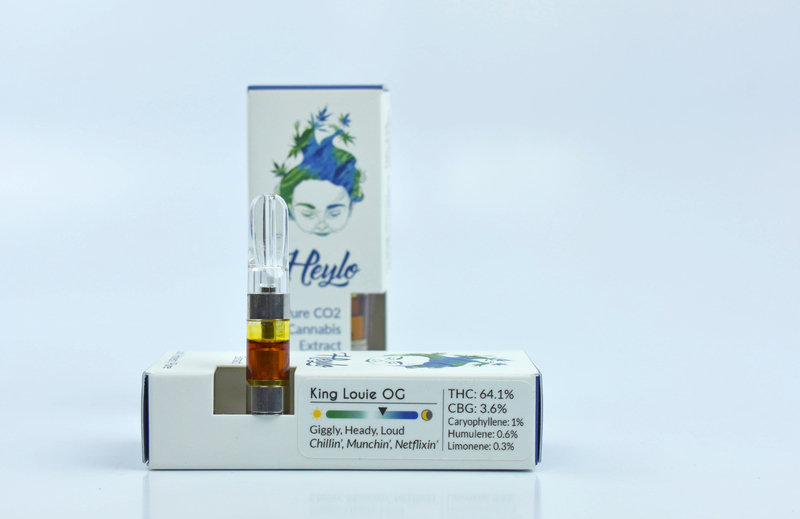 King Louie OG by Heylo, with terpenes caryophyllene, humulene and limonene. By now you have likely read about a few of the properties of some of the most common terpenes, such as myrcene, terpinolene, limonene and caryophyllene, as well as some of these terpenes anticipated effects. Myrcene: The most common terpene in cannabis. It is also known as the "couch-lock" terpene for its highly-sedative effects. Limonene: Common in citrus, it is highly-energetic and a known anti-depressant. Terpinolene: A smokey or woody aroma that is slightly sedative, antioxidant, anti-cancer and antibacterial. Beta-Caryophyllene: Gastroprotective and a strong anti-inflammatory with a woody, peppery taste. Alpha-Pinene: Energetic and therapeutic, this terpene is common in pine needles, of course. Humulene: The main constituent of hops is a strong anti-inflammatory agent and a hunger-suppressent. While there has been research on the various medicinal properties of terpenes, it is also important to know that these chemicals, just like cannabinoids, do not exhibit uniform effects across all people. With flower, your smell makes a difference! If you have the opportunity to smell your flower/bud before you buy it you have a tremendous tool to understanding whether or not your endocannabinoid system is receptive to the terpenes in the bud. If it smells wonderful to you, give it a go! If not, you might want to stay away, or at least experiment with a watchful eye. While you do not have the opportunity to smell the oil in your vape cartridge, if you find terpenes on the box you should have some clear indicators as to how the oil might affect you. If myrcene is the top terpene in a concentrate and if it has a concentration greater than 1%, it is likely to produce typical “myrcene” effects - i.e. sedation. Myrcene can be useful for treating pain and anxiety, but it is not an ideal terpene for people looking to engage in normal activity with cannabis. These two terpenes exhibit nearly the opposite effect of myrcene. They are highly-energetic and uplifting. Limonene is an exceptional mood-lifter while pinene has neuroprotective benefits and may aid in preventing memory loss due to THC. The energy produced from these terpenes however, may be excessive for a person looking to simply treat pain or anxiety. Terpinolene stands out among the most-common dominant terpenes for it’s unique flavor (herbal, woody, gasoline) and for its curious effects. For some, terpinolene is energizing and creative. For others it behaves more like myrcene, introducing a calm relaxation. To understand how terpinolene may affect you requires trial-and-error. Lastly, check to see if the product’s analytics are on the company’s website. For instance, Heylo publishes all of our chemovars (strains) on our website alongside terpene information. Check it out!